Senator Benigno Aquino, sitting in front of a drawing of his late mother on Tuesday, is poised to win the Philippine presidency. 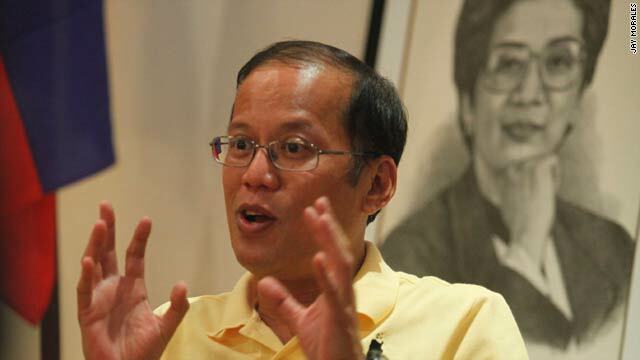 Manila, Philippines (CNN) -- Sen. Benigno Aquino III, the son of former Philippine president Corazon Aquino, led contenders for the Philippines presidency Tuesday, as authorities tabulated returns from the country's national elections. With nearly 79 percent of the votes counted, Aquino surpassed his nearest challenger, former president Joseph Estrada, by more than 4.5 million votes out of the 30 million counted, according to figures from the national Commission on Elections. Two other candidates -- Sen. Manny Villar Jr. and Gilberto Teodoro -- ran far behind. On Tuesday Villar conceded to Aquino in a live press conference aired on local TV. In all, nine candidates were running for the presidency. Aquino, nicknamed "Noynoy," is also the son of Sen. Benigno "Ninoy" Aquino Jr., who was assassinated in 1983, as he returned from exile to lead opposition to Cold War-era Philippine strongman Ferdinand Marcos. Corazon Aquino, who died in August, took over the leadership of her husband's movement and became the country's first female president in 1986. 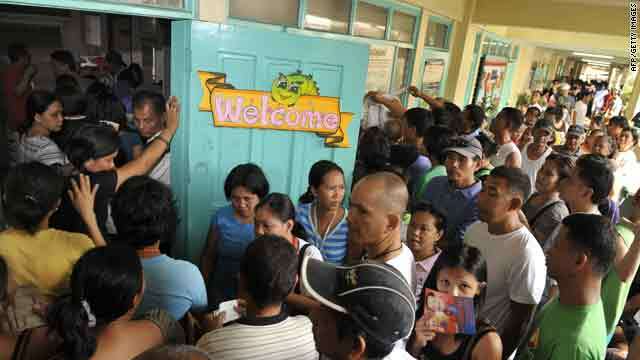 The Philippines appeared to pull off a successful inaugural election using automated electronic voting machines with some glitches involving a malfunctioning machine here and there and long queues. Voting was extended by one hour to ensure that people could vote. Election Day on Monday began with an air of apprehension because of a faulty test run of voting machines last week, which raised questions as late as Wednesday of whether the elections would even happen. Still, many people at polling stations expressed excitement at the idea that automated machines would protect the integrity of their votes, given the widespread allegations of fraud and cheating in elections past. At one polling station in Manila, one of the machines had malfunctioned, and a man had insisted on waiting until he could feed the ballot into the machine himself. "I want to make sure my ballot was tabulated properly," he said. In Manila, Election Day brought an almost festive atmosphere. At one spot, a church watchdog group set up an altar to hold a day-long vigil praying for a peaceful and successful election. That was not the case in southern Mindanao, where four municipalities declared election failure after poll workers reported harassment and death threats. The election commission accepted the declarations and said it would re-schedule a special election in Mindanao, an island where a political massacre left 57 people dead in November. In 2007, 13 municipalities in the same area declared election failure and re-held the elections after a year. Also on Mindanao in Zamboanga del Sur province before polls opened on Monday, a gunman killed three people and wounded at least five at the house of a mayoral candidate, a military spokeswoman said. Election monitor Leila De Lima, chairwoman of the Commission on Human Rights of the Philippines, emphasized the importance of the vote. "It's a very crucial litmus test to our democracy, our fragile democracy," said De Lima. "The administration has been hounded by issues of corruption, human rights violations. People are looking forward to a new administration that will hopefully usher in meaningful changes. So, it's very, very important."